No player in this draft class has had a worse 6 months. 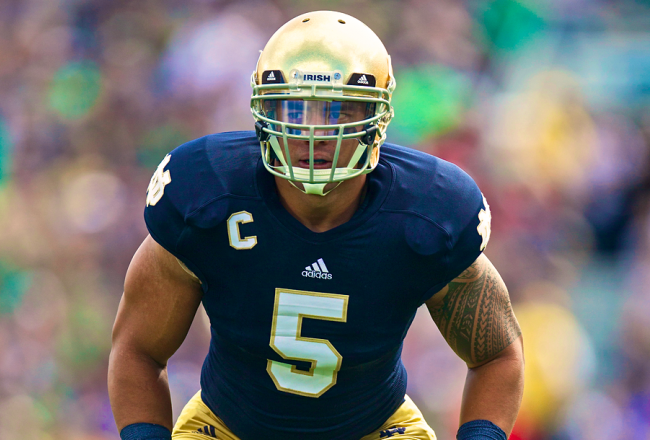 Although the Notre Dame Fighting Irish had a great regular season, Te’o himself underwent a ton of adversity. In September 2012, prior to the game against Michigan State, Te’o gets a phone call that his grandmother had passed away. A few hours later, Te’o gets another call that his girlfriend, Lennay Kekua had also passed away. Te’o goes out against Michigan State and records 12 tackles and leads his team to a victory against the Spartans. In the post-game interviews he mentions the two deaths and the entire country is fascinated with the story. The Fighting Irish continue to win and end the regular season undefeated, ranked #1 in the BCS standings and will play Alabama for the National Championship. On December 6, 2012, just after an ESPN award show he gets a troubling phone call from Kekua who now says she is not dead. Not sure what to think, Te’o keeps the information to himself and finishes second that weekend in the Heisman Trophy balloting. Strangely Te’o did mention Kekua again in an interview during the Heisman festivities. After the Heisman weekend, Te’o confided in a friend and asked for guidance. The friend told him he needed to tell his parents, but he waited until December 24, 2012 to do so. On December 26, 2012, after speaking with his parents, Te’o meets with Notre Dame coach Brian Kelly and Notre Dame officials and informs they that he has been a victim to a hoax. The school launches an investigation and finds that Te’o was a victim of an elaborate hoax where someone pretended to be Lennay Kekua and that she in fact did not exist. At this point, the information still had not gone public. On January 7, 2013 the Fighting Irish face the Alabama Crimson tide in the BCS Championship Game and is thoroughly embarrassed. The Tide whipped the Irish 42-14 and the Irish were never really even in the game. Te’o and the rest of the defense had no answer for the Alabama power running game and the Crimson Tide offense line ripped gaping holes in the Irish defense the entire night. Then on January 16, 2013 the news breaks that Lennay Kekua never existed. Te’o was thrust into the spotlight as the media tried to make sense of the story. Te’o suddenly became the biggest story in the country and everyone seemed to have their own opinion. In an effort to finally set the story straight, Te’o went on the Katie Couric show to explain exactly what happened. As the media continued to probe the facts, the details seemed to be consistent with the story that Te’o told, that he had nothing to do with the scheme and that he was the victim of an elaborate hoax. With the story behind him, Te’o moved on the NFLCombine. He was the most sought after athlete during Combine week and his Combine press conference was one of the highlights of the week. For the entire week, he continuously was asked about the hoax. To his credit, he handled everything well and according to NFL teams his personal interviews with them were very impressive. His on-field workouts however were not. Te’o only ran a 4.82 40 yard dash and for the most part he labored through the drills, not looking smooth at all. Last week, Te’o participated in the Notre Dame Pro Day and looked much better. He improved his 40 time into the 4.7 range which is where most people thought he would run. He seemed much more relaxed and was able to concentrate solely on football. The Pro Day workout ended up much better than his Combine performance. In November I don’t think there was anyone that questioned whether or not Te’o was a first round pick. Now some people are questioning whether or not he goes in the first round. Prior to the BCS Championship Game, my evaluation on Te’o was that he was extremely smart, instinctive and always in position. It seemed like Te’o knew where the ball was going before the ball was snapped, could avoid blockers and made sure he was there in time to make the play. Against Alabama, he seemed a step slow and out of position. Alabama guard Chance Warmack was able to get him and drive him 5 yards downfield allowing the Alabama backs to play off the block and get big chunks of yardage. Even when Te’o was in position to make the play, he missed several tackles. Blaming the entire Alabama loss on Te’o would be unfair. The entire defense got thoroughly man handled that night, but Te’o was the leader of the defense, so ultimately a big chunk of the poor play falls on him. Now NFL teams need to make an evaluation and decide what to do with an overwhelming amount of data. First off in regards to the hoax, I believe Te’o could have handled it better. He knew the truth for several weeks without saying anything. That gives the impression that he had something to cover up. I do, however, believe he was truthful about the incident once the story became public knowledge. Te’o has also done a good job of addressing the issue once it became a headline. I believe he is sorry that it happened and embarrassed by the whole ordeal. The public needs to allow him to move on. In regards to his workouts at the Combine, I believe that all of the interviews, both public and privately with teams wore Te’o out. The on-field portion of the Combine is the last part and I think he was just out of gas. If you fast forward to his Pro Day, he had a much better workout when he was allowed to just concentrate on football. I also believe that Te’o is a player that is going to impress you more with pads on than he will in shorts. He isn’t the strongest or fastest player on the field, but he will beat you with his work ethic and preparation. Ultimately I think he had one bad game. It happens, even with the best of players. He had a lot on his mind, was distracted and wasn’t able to function like he normally does. If you look at the remainder of his career, you will find a good kid with high character and good leadership qualities. Manti Te’o was the heart and soul of the Irish defense and he’s the kind of player most teams would love to have in their locker room. I think he will be a first round pick. He probably won’t be in the top 15, but I think somewhere between the middle and end of the first round, some team is going to give him a chance. I think once he gets that chance, Manti Te’o is going to take it and run with and have a very good professional career. This entry was posted on April 1, 2013 by draftmaniacs in Draft profiles and tagged 2013 NFL Combine, 2013 NFL Draft, 2013 NFLDraft, Mani Te'o, Notre Dame football.